Ajinomoto Stadium was built in 2000 on the site of a former US military base. It officially opened on 10 March 2001. Despite conforming with FIFA requirements, Ajinomoto Stadium was not selected as a 2002 FIFA World Cup stadium. Until 2003 the stadium was called Tokyo Stadium, but it changed names to Ajinomoto Stadium as a result of a sponsorship deal. Ajinomoto Stadium is located in the Chofu area in the west of Tokyo, just under 25 kilometres from central Tokyo. The stadium is best reached by train. It lies a 5-minute walk away from Tobitakyu station, which is on the Keiō line. The Keiō line can be taken from Shinjuku Station, which is on the Tokyo metro and can be easily reached from central Tokyo. An alternative is Tama station, which is a 20-minute walk from the stadium, but on matchdays there are shuttle buses. Tama Station is on the short local Seibu Tamagawa Line, which can be transferred to from Musashi-Sakai Station. Musashi-Sakai Station is connected with central Tokyo through the Chūō Line. Tickets for FC Tokyo matches can be bought online through the official FC Tokyo ticketing website or any of the other online ticketing partners. Tickets can also be bought in person at any Lawson, Seven-Eleven, FamilyMart, PIA, MiniStop, or Circle K convenience store. Tickets are generally also available on the gate of the stadium on the day of the match. Ticket prices for FC Tokyo matches range from Y$ 2,300 for a seat behind the goal to Y$ 5,200 for a seat at the main stand. Tickets are Y$ 300 or Y$ 400 more expensive if bought on the day. Tickets for Tokyo Verdy games can be bought online or through the same convenience stores as FC Tokyo , as well as the Internet and telephone booking options these stores offer. Tickets are also available on the gate of the stadium on the day of the match. Tokyo Verde rarely sell out. Ticket prices range from Y$ 2,100 for a general admission seat behind the goal to Y$ 4,500 for a seat at the main stand. Tickets are Y$ 500 more expensive if bought on the day. FC Tokyo as well as Tokyo Verdy may at times play a home match at the National Stadium instead of Ajinomoto Stadium. 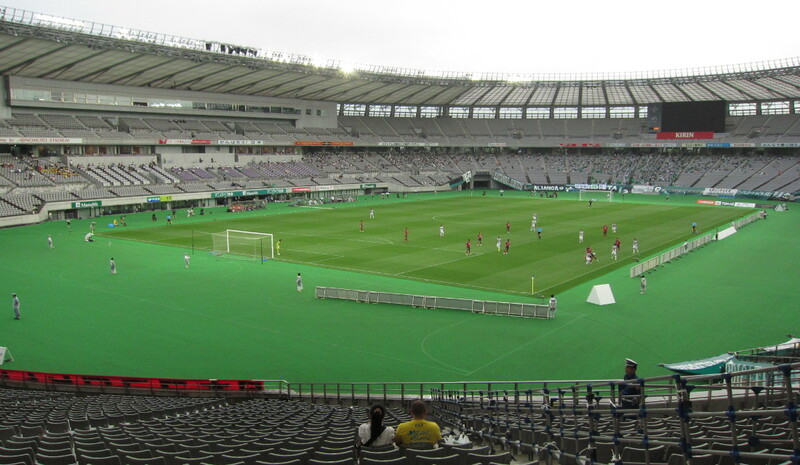 Ajinomoto Stadium offers guided stadium tours that last just under an hour. Tours run on selected dates that are announced on the Ajinomoto Stadium official website. Reservations can be made by phone +81 (0) 42 440 0813, or by faxing the application form on the official website. Fctokyo.co.jp – Official website of FC Tokyo. Verdy.co.jp – Official website of Tokyo Verdy. Ajinomotostadium.com – Official website of Ajinomoto Stadium. Gotokyo.org – Official Tokyo travel guide.